Note: If you have not read TJ Klune’s Bear, Otter, and the Kid (BOATK), go do that first. This is the sequel, and it is as amazing as BOATK, so if you haven’t already read Bear, Otter, and the Kid , go do that, then come back for this utter awesomeness. I LOVED this book. I approached this sequel to Bear, Otter, and the Kid with some trepidation, because BOATK ends on a pretty happy note. In my head Bear & Co. were all living their happy ever after lives, and I was a little anxious about having them come back to the “real world” for the sequel: Who We Are. All I can say is, it was totally worth it. The conversations the characters have in this book are genius. I read a good chunk of the WWA backstage in the dressing room of a show I was working on (I had a lot of down time, most of which I spent reading on my smart phone), and I am sure that everyone though I was nuts because I kept laughing out loud and making faces at my phone while I was reading. Tyson McKenna slays me. And his epic poems are so, so epic. Don’t believe me? TJ has some great freebies on his blog from the BOATK characters. Ty’s Christmas poems are especially brilliant. There are sad thing that happen too, (I’m not giving anything away), but it’s all worth it in the end. Plus I am cured of my trepidation regarding any future BOATK sequels. I want more! 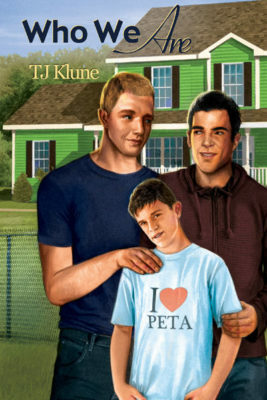 I can’t wait to read about what happens with Tyson and Dominic when Ty grows up. I really hope this isn’t the end.